Luckenbach, eat your heart out! As a person who’s from a small town myself, I hate to start this entry by saying something insulting like, “There’s a little town in Texas…” but I think if I referenced Booker, Texas as a “small town,” not only would they not take offense, they might even consider it a compliment. 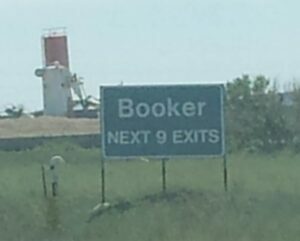 Booker is town of just under 1600 people. Like a lot of towns in the Texas Panhandle its tallest structure is a grain elevator, and like a lot of towns in the Panhandle, it’s neatly kept and populated with good folks. As you enter town on the east-west highway that runs through it, you’ll see a sign that looks a lot like those you’d see on any interstate that reads, “Booker – Next 9 Exits.” As you might have already guessed, there are 9 North-South streets you’ll pass as you go through. There may be any number of marketing lessons here, but to me it’s just a good reminder that whatever you do, you should worry less about what anybody else thinks or about trying to be like somebody else, loosen up, get comfortable in your own skin, and just enjoy the journey. Comments Off on Luckenbach, eat your heart out!